Custard Creams, along with Bourbon biscuits, are two of the traditional favourites that every home needs in their biscuit tin. 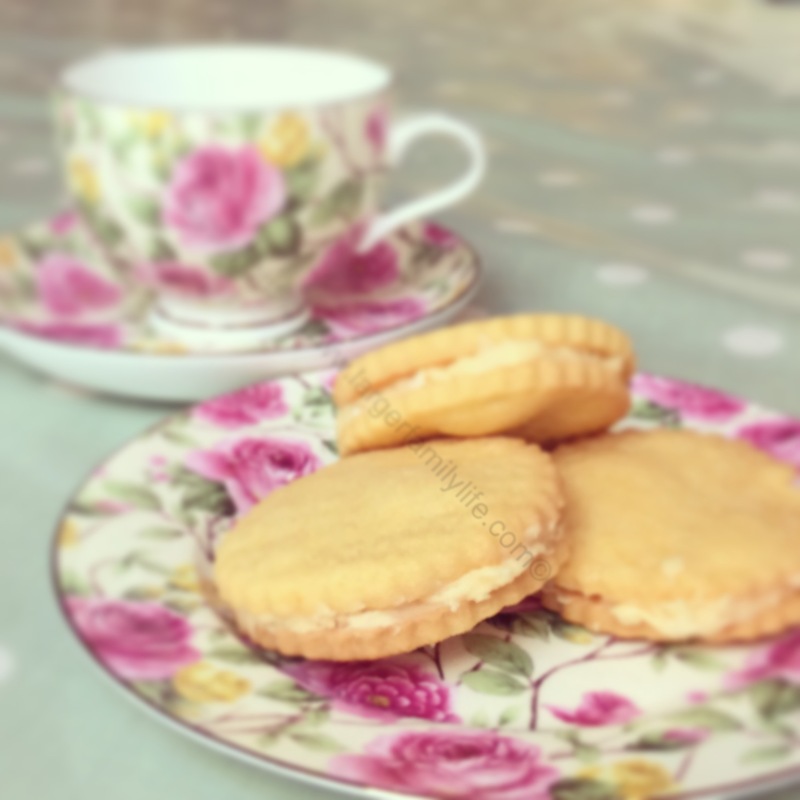 Homemade custard cream biscuits taste even better than shop bought, and what’s more, they are surprisingly easy to make too! Rub butter and flour together using fingertips until they resemble breadcrumbs. Stir in caster sugar, vanilla extract and custard powder. Add milk and bring mixture together to form a pliable dough. You may need to adjust the amount of milk used to get the right consistency of dough depending on the flour used. Add a little at a time – it’s easier to add milk than to take it away! Wrap the dough in clingfilm and put in the fridge for half an hour. If time is against you, you can pop it in the freezer for 10 minutes instead. Remove the dough after chilling and roll out thinly on a floured surface. The dough should be about 3mm thick. Use a cutter measuring approximately 3″ to cut your rounds, placing them on a greased baking tray ready for baking. Before placing them in the oven, create patterns on the biscuits by lightly pressing the small, dimpled side of a cheese grater down on them. Place the biscuits in the oven for about 6-8 minutes until just baked. You don’t want them to turn too brown and they should still be slightly soft when you remove them. Leave the biscuits to cool on the trays for five minutes. This will allow them to firm up slightly before transferring them onto a wire rack to cool completely. While waiting for the biscuits to cool start making the filling. Beat the softened butter together with the custard powder and icing sugar until it you’ve created a smooth mixture. Wait until biscuits are fully cooled down before smoothing a layer of filling onto the smooth side of one biscuit and sandwiching together with the second biscuit – again smooth side in. Remember, the patterned indentations should face outwards! I believe these biscuits can be stored in an airtight container for a few days, however we did not get to put this into practice as the child-roaches descended on them in full starvation mode. Note: Some people, like Cait for example, find that the mixture tends to go onto their fingers quite often and in fairly large quantities. If you find yourself suffering in the same way, Cait’s tried and tested expert solution is to pause and lick your fingers clean ensuring you clean your hands before continuing to handle the rest of the food. I LOVE custard creams and bourbons! I am definitely going to give this recipe a go!